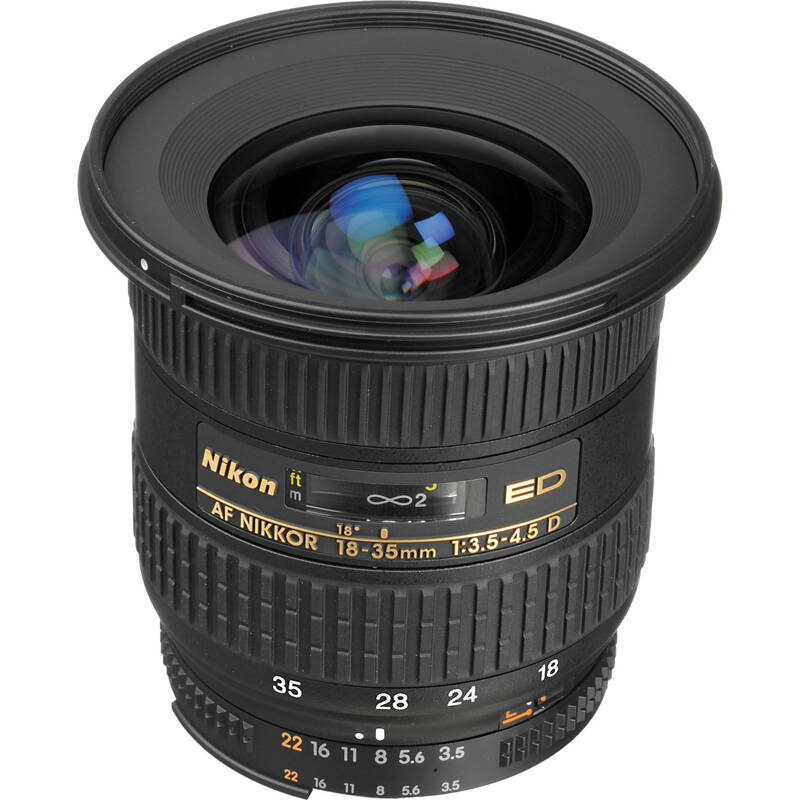 This lens is ideal for the photo enthusiasts looking for an compact ultra wide to wide angle lens. With a focus distance of 1' to infinity, it is ideal for landscape, candid, environmental, close-up and full-length portrait photography. AF not supported by D40 and D60 cameras. ED glass element reduces chromatic aberrations providing superior optical performance even at maximum aperture. Internal Focusing design enables the lens to be both autofocused and manually focused without changing the lens size or rotating the filter atachment. Box Dimensions (LxWxH) 7.4 x 5.7 x 5.5"
Nikkor 18-35mm f/3.5-4.5D ED-IF Autofocus Lens is rated 4.5 out of 5 by 29. Rated 4 out of 5 by George from Good Price-Performance Balance This lens was purchased just before a trip to Joshua Tree National Park for use on my D700. I could have used my Sigma 10-20mm from my D300 lens kit but, for the price, the Nikon 18-35mm looked like a good buy and preserved full image file size. While I noticed a slight amount of CA in one image, overall the 18-35mm worked very well. I couldn't see the additional dollars for Nikon's 16-35mm f4 VR lens. I usually use a tripod or, if hiking, a monopod so the value of VR in a wide angle lens is marginal. And since I usually shoot at f8 or slower, Nikon's fast wide zooms aren't for me. Having read a number of reviews I ordered the 18-35mm and am pleased with my decision. Rated 5 out of 5 by wumo from A Winner I keep looking at more expensive glass but can't come up with an excuse to replace this lens. The 20-35 is too heavy to lug around all day, the 14-24 won't take filters, and the 16-35 is too long. This was $ new and has taken great photos over the past 7 years with no problems. Shooting indoors without flash on the D700, with its incredible ISOs, there's no advantage in moving to a faster lens. Here's one lesson in 40 years of shooting: the heavy glass ends up staying in the bag. So I end up asking myself, why pay out well over $1000 for a lens that is hardly optically better, hogs room in the bag, and weighs too much to want to use often? You can knock off points for distortion and sharpness, but this lens deserves five stars for value, performance and quality in its price range. Rated 5 out of 5 by Anonymous from Good all around lens I used this lens a lot for weddings in small rooms. It's very sharp. My clienteles normally have part of the wedding in the home so rooms are very tight and this can cover the entire thing. I also used this lens 100% of time at reception to get the whole group at the round tables. Expertise: Amateur Problems Encountered: The hood is bad. I doesn't do much. My new Nikon 17-55mm has better hood that extend quite far out to prevent glare.Not able to shoot at the angle I want if the sun is present. I bought the polarizer filter but didn't help. Items I Recommend: Polarizer filter? Rated 5 out of 5 by jimmyd from There is nothing wrong with this lens I heard the rumor Nikon was coming out with a 16-35 so I waited, then I found out it would be $1200.00. So I got the 18-35 before it disappeared. Like so many things I read what so many no it alls said about this lens. I wish I would have never read what people said and just bought it. I shoot with my D700 and my results are excellent and it rounds out my travel kit wonderfully. The more expensive lenses in this range may be better but I can't see it would matter to me. It zooms smooth and as far as I can see there are ZERO problems with sharpness. It is reasonably light in weight and I carry a lot less lenses with using only my three zooms now. Easy to carry and the price is right and the results are excellent, What more can I ask for. By the way, for what I saved on this rather than buying the big guns, I am going to Europe this year. Rated 5 out of 5 by Anonymous from Wide is very WIDE! I bought this lens because I needed a wide with some versatility for a golf trip to Pebble Beach. I've used it for a few pictures with my D700 and have to say the results are really good. I can resolve some of the barrel distortion using Photoshop, so I'm not too unhappy about getting it at 18mm. This lens isn't expensive, but it is expensive to me. So, for the money, I'd have to say I'm really pleased. Rated 3 out of 5 by Ken from Good for the price Not the same speed, build quality or optical quality of the 17-35mm 2.8 - but at one third the cost it's good to have Nikon glass. Stopped down it's much better than wide open. I only use a lens of this focal range once in a while for sweeping views of the church, couple on the beach, all encompassing view of the reception venue. It's worth the $1000 savings for the frequency of use it receives. That being said, I will ultimately get the 17-35 (or the 14-24) just because I'm a stickler for the ultimate quality. Rated 4 out of 5 by Carabell from Great Lens used on tripod I use this lens exclusively for landscapes and have been more than pleased with the results. It is very light weight and fits in my small bag easily despite the 77mm front. When shot on a tripod or monopod in the f5.6-f16 at low ISO's my lens is tack sharp and produces large prints with little trouble. Good job Nikon. Rated 5 out of 5 by Anonymous from Great travel lens! I love this lens. It's versatile, fairly light weight and perfect for landscapes and travel. I had the same lens for five years and traveled the world with it. On a recent trip it got smashed in a fall. I promptly replaced it with the exact same lens. Will this lens give me full frame capability using a D600?Is this a Grey market lens? The Nikon 18-35mm lens is a full frame lens, so would be fully compatible with the Nikon D600. This lens would be distributed through Nikon USA, and come with the Nikon 5-Year Warranty (1-Year International + 4-Year USA Extension).